TagBall Sports - Bell Metropolitan Education and Achievement Club (MEAC) Psychology of PlayPlay defined in psychological terms is an exercise that enhances youth toward the beginning stages awareness of the concept of their industry and formative background in maturing toward the adult level or work and performing a job. Physics defines energy as the ability to do work. TagBall can promote play and energy indiscriminately. Bell MEAC was founded as an organization to mentor at risk youth, by Phillip Bell Jr. Based out of Waldorf, Maryland has mentored thousand of youths in the Washington, DC, Maryland, and Virginia area. Bell MEAC mentors youths by pairing them with mentors who may share common interests in an effort to get the youths to think about their future. Bell MEAC mentors in the following areas:SportsHorse Back RidingCamping and Outdoor ActivitiesCanoeing and KayakingAviationMilitary Base TripsTutoringThrough the mentoring, TagBall was created as an activity to augment in the sports area of mentoring. Through this activity, it was discoverd, due to its non-contact nature, and the capability to be played by all, TagBall was a huge hit with the youths. Speaking EngagementsThe Bell MEAC team is available for speaking engagements for your organization. Let our dynamic motivational speakers invigorate your crowd. We are available to speak at:ChurchesSchoolsBusiness Organization Professor, Phillip Bell, JR. MA, author of " Run In My Shoes " , and Bell/ MEAC counselors and consultants can provide lectures, town halls meetings, non credit classes, workshops, and training programs in the areas of Urban Sociology, Diversity, Race Relations and Ethnic Relations, while incorporating Tagball as a Team builder and Ice breaker activity.﻿ Contact us for an appointment! Play defined in psychological terms is an exercise that enhances youth toward the beginning stages awareness of the concept of their industry and formative background in maturing toward the adult level or work and performing a job. Physics defines energy as the ability to do work. TagBall can promote play and energy indiscriminately. Bell MEAC was founded as an organization to mentor at risk youth, by Phillip Bell Jr.
Based out of Waldorf, Maryland has mentored thousand of youths in the Washington, DC, Maryland, and Virginia area. Through the mentoring, TagBall was created as an activity to augment in the sports area of mentoring. Through this activity, it was discoverd, due to its non-contact nature, and the capability to be played by all, TagBall was a huge hit with the youths. 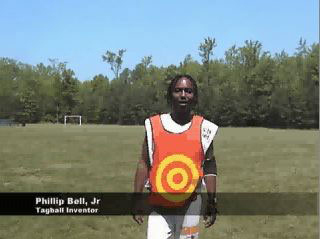 Professor, Phillip Bell, JR. MA, author of " Run In My Shoes " , and Bell/ MEAC counselors and consultants can provide lectures, town halls meetings, non credit classes, workshops, and training programs in the areas of Urban Sociology, Diversity, Race Relations and Ethnic Relations, while incorporating Tagball as a Team builder and Ice breaker activity.